Love is certainly in the air at Drusillas Park as we celebrate some of our pawfect pairs this Valentine's Day. 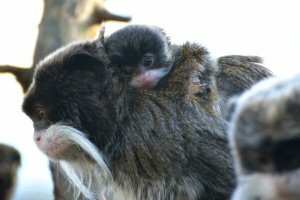 Emperor tamarins, Lucy and Tiny Tim are one of the zoo’s long standing couples. 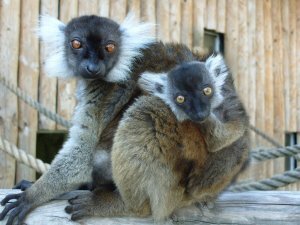 This fan-tash-tic pair were introduced in 2005 and since then the mini monkeys have been making a huge impression on each other. This year to mark their tenth anniversary, they gave each other the greatest gift of all; a new heir to their animal kingdom. The baby bundle was born on 19 January and is the couple’s ninth baby born at the Park. 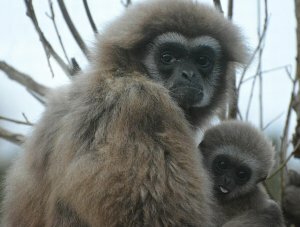 Also arriving in style in 2005, Ulu our gorgeous lar gibbon flew into the zoo on a private jet no less! He quickly settled in and was then introduced to female companion Tali, as part of a European breeding programme. The loved up couple fell for each other straight away and Pattini, the couple's first baby was born in 2006. Since then they have had two more babies; Sholo and Pudsey and the fabulous family live together at the zoo. Lovers and Lemurs Clementine and Lotfi were introduced at Drusillas in 2010 and the couple have been inseparable ever since. They wasted no time in starting a family together and have had a baby every year since! Their eldest son, Tsito, was born in 2011, followed by Malala in 2012, Prince George in 2013 and Zebedee in 2014. We wonder what 2015 will bring! For Linne's two-toed sloths, Sof and Sidone it’s all about sloooooow dating though! The lazy lovers were introduced at the zoo in 2014 and since then they have been taking their time getting to know each other and hanging out in true sloth style. So keep your toes crossed for another addition to our topsy-turvy family in the not toooo distant future. However, there will be one lonely heart at the zoo this Valentine’s Day. 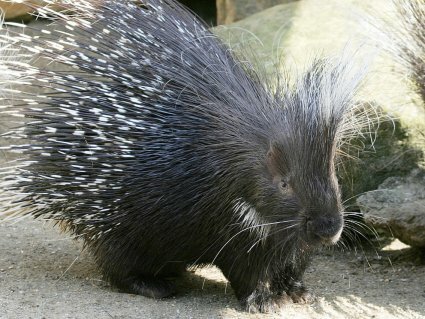 Robbie the porcupine arrived at Drusillas Park in 2004 and lived happily alongside his female companion Tisha until a month ago, when she sadly passed away following a short period of illness. Since then the zoo team have been working hard to find Robbie another prickly partner but so far the search for lady quills has not proved brill.